Domestic Apologist: 7qt / fibromyalgia, they say. In various and vague terms, I've tried to write about the pain and crosses Sean endures each day (and night), pain that for over a decade went undiagnosed and still seems entirely unresponsive to medications. My resolution for 2014? Find a way to write about his (our) struggles in a way that feels less like like descending into the pit of despair and more like saying to good friends: Let us pray for one another. Fifteen years ago, a family doctor called it growing pains. Five years ago (right before Sean and I married), a rheumatologist in Washington called it ankylosing spondylitis (a form of arthritis). Three years ago, two top neurosurgeons in San Francisco told us it was spinal stenosis and degenerative disc disease. Sean would be in a wheelchair by the time he was 40. Two years ago, a naturopath in California called it a body-wide infection. One year ago, a pain specialist in Seattle called it... nothing. And maybe Sean should try yoga. Save for the Seattle doctors and the doctors from Sean's childhood, I've been convinced of each doctor's diagnosis at the time. After each diagnosis came some suggested treatment: prescriptions with horrendous possible side effects (like cancer); surgery with hazards (like early paralysis), allergen therapy with requirements to eat rabbit for three days (fun fun fun). 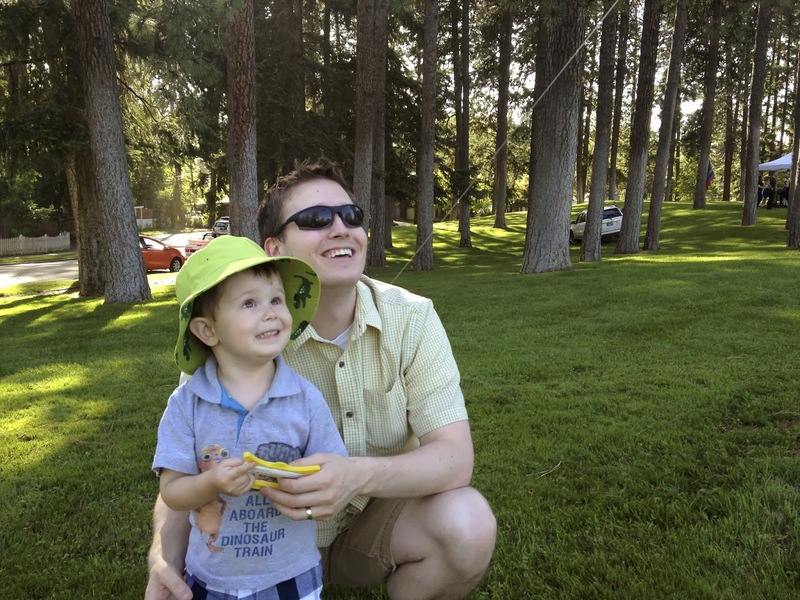 Three months ago, Sean spent 10 days with specialists at the Mayo Clinic in Rochester, Minn. They called it fibromyalgia. And this time, I think it's final. I think they're probably right. This is my life's flip side; this is the non-photographed, non-mentioned-but-ever-present topic in my mind. Every single day, my thoughts swirl around three things: when we'll have our next baby, how and when I'll finally get to live near my family again, and how and where we'll find help for Sean and his pain. They're all intertwined, bundled together like a 3-for-the-price-of-1 bargain in my thoughts and prayers and pleading with God. I know, how generous of me, making it so easy for God. See, Lord? I'm only asking for a medical miracle, a job relocation and more trust in your Divine plan for our family. That's all! Having a diagnosis, however, relieves some of the uncertainty in our future. In time, with much trial and error, we'll probably find the right combination of drugs that will lessen some of Sean's symptoms. But that means more time waiting, more time summoning the courage to try something new, more time waiting for it to work. More time not getting it right. More time enduring nasty side effects. More time weighing the pros and cons. More time spent working on a problem that has already consumed so many resources. In spite of all that, this story has silver linings, the extent and brightness of which I doubt I'll truly understand in this life. The prayers, the novenas and Masses, the fasting and sacrifices family--and friends like family--have made for him... it overwhelms us. And it fills me with more gratitude than I thought possible. Both people I know and love--and people I've never met--who heard that Sean is a young dad with two small boys who is in pain and needs prayers; they've all entreated Our Blessed Mother and her Son to be with us during this trial. 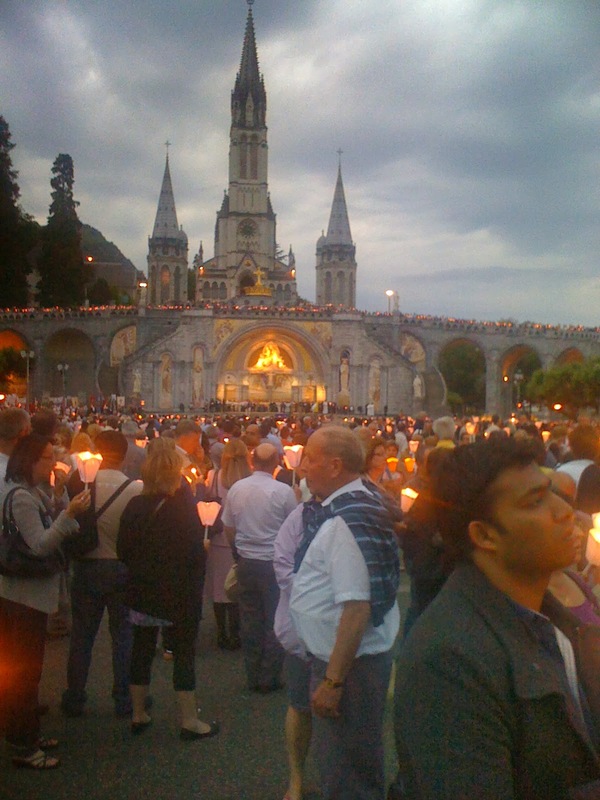 In 2011, Sean went on pilgrimage to Lourdes--or as he calls it in the most reverent way possible, Disneyland for Catholics. 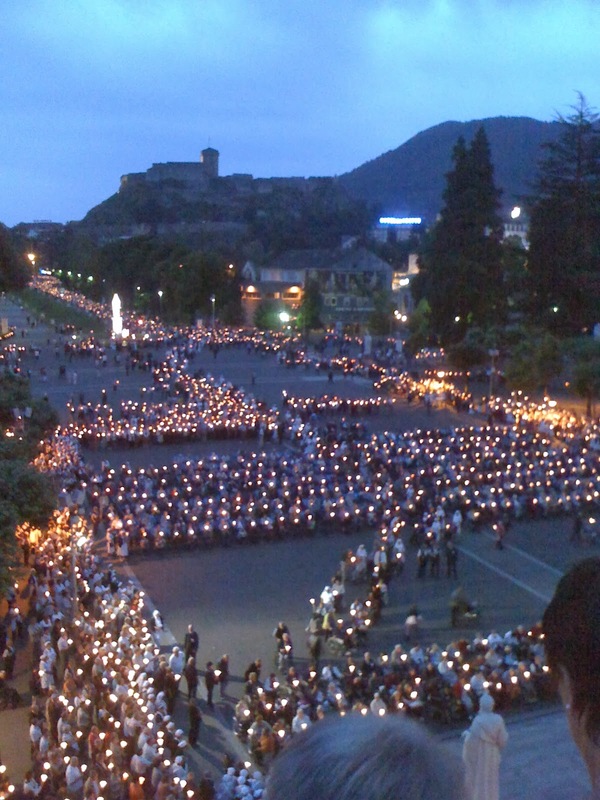 Each night during the good weather months, pilgrims gather and chat Ave, Maria by candlelight. Beats the Electrical Parade, ehh? 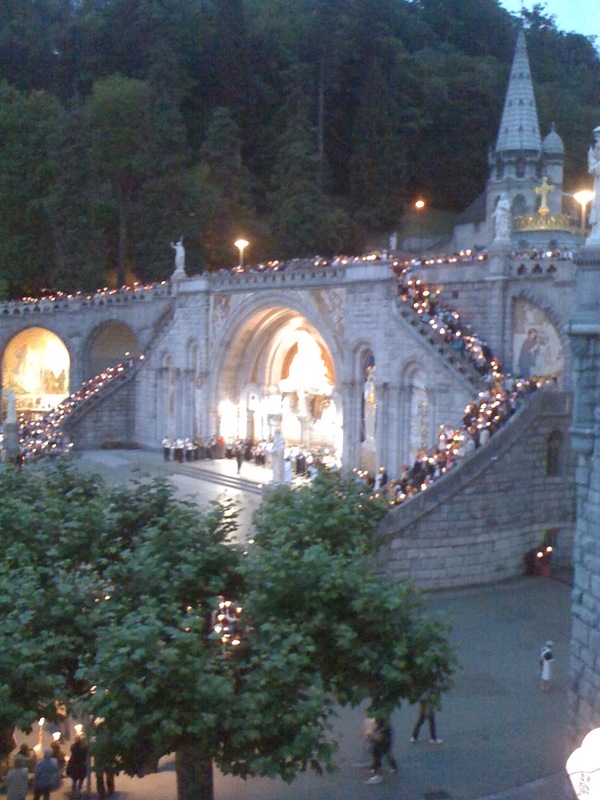 Going to Lourdes had been one of Sean's lifelong dreams. He bathed in the water and asked God for a miracle, if it be His holy will. His journey to Mayo was something of a pilgrimage too: Going to a secular place of healing, asking for an answer. We have an answer. Now we're praying for what to do with it. Next steps? Seeing a new local neurologist who specializes in fibro. That appointment is next week. I'm praying for a doctor with good insight. For patience, endurance and perseverance. For gratitude that doctors and medicine are readily available to us, even if we haven't found the right ones yet. For the many other people who struggle with fibromyalgia, with misdiagnosis, with years of pain. I'm praying for our family's own little miracle. As always, the lovely Jen has more for your friday dose of the 7's. Oh Mary! Is there any solace in being out of limbo land? That nasty place of not-knowing... Regardless, we'll continue to pray for your family, especially in light of Sean's diagnosis! Unrelated: that first picture is adorable. I will definitely keep your husband and your family in my prayers. I've so enjoyed following your blog, and thanks for sharing what I know must be a hard thing to write about!